* The style of presentation by any one of the methods mentioned above should be consistent on any one sheet. * Where a new drawing or a specified part of the drawing depict new design to be installed, the drawing or the part of drawing should be marked “ALL NEW WORK” in red. * Where recoveries are involved, a large green cross can be provided across the sheet if the whole sheet is to be redundant or green cross should be provided through the discreet parts and bounded by a green border. * However, dotted green should not be used to show recoveries to avoid confusion with dotted symbols depicting equipment physically removed but remaining in the interlocking logic. * Where an existing element or portion of drawing on a sheet is shifted to another sheet, both the sheets should bear a suitably coloured note to that effect with relevant sheet nos. * The Index sheet should show the status (red, green, combined, new, abolished) of each sheet produced. * Blue colour is also used in situations to draw the attention of the tester to a particular part of the design. * If there is a need to alter the original design, the sheet to be re-issued under a updated version. It shall be a single line sketch, drawn to scale to show signaling features and identities. Operating notice diagrams (N section 5.5), need not be to scale. When plans of greater lengths are needed,non-standard drawing size can be used , but the height of drawing should correspond to one of the standard A sizes and the length is a multiple of 210 mm. This ensures that prints of all plans can be folded to A4 size. It should be ensured that the title block is visible when the drawing is folded. Text should be of minimum 2mm size. Avoiding sheet breaks and scale changes in S&C and other complex areas. Where the whole plan is on the same scale, it should be shown on title block. 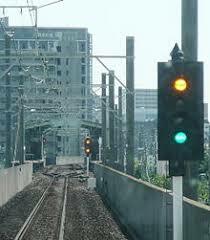 * Center point of a signal box, level crossing or interlocking (only built installation, not proposed one). The preferred unit of measurement is METRE, but imperial measurements also may be shown where documented in the design specification. Measurements should generally be rounded to the nearest metre or yard. Speeds should be quoted in the same units as speed restrictions are published in the sectional appendix., ex miles per hour. Not yet commissioned or Redundant functions. Where the final design is to be installed together, but to be commissioned in stages, the final design can be used for each stage, with clear endorsement for identification of circuitry not used at that stage. The drawings issued for the first time shall have “All New Work “ stamp in red.All the circuitry and equipments to be commissioned or redundant should be shown situ in the circuit diagrams. Partially commissioned or redundant circuitry should be identified on production diagrams with notes with arrows, or suitable symbols defined on each sheet. These are coloured red. If a drawing or a discreet part of the drawing depict partially commissioned/redundant circuitry, the whole drawing or the discreet portion with a distinct border should be endorsed with a note. Typical Notes are furnished on page L8. Control Tables are to be printed in A3 or A4 size. Criteria for the text size is readability and so A4 size is ok under favorable working conditions but A3 under poor working conditions. On A4 size prints, a minimum text size of 2mm is considered acceptable.